This week's playing of the Arnold Palmer Invitational at Bay Hill Club and Lodge in Orlando marks the first time that Arnie was not present to host his event. Having passed away last September there have been numerous stories and tributes to this legend of the game of golf. When I was the teaching pro, working for Dow Finsterwald, at the Broadmoor in Colorado Springs in 1977, he related a story about he and Arnold and one of Arnold's favorite drivers. In the backroom of the golf shop at the Broadmoor, Dow had several large golf bags with many of the clubs that we had used through his career. I was looking through the bags one day and came upon an old circa 1960 Wilson Staff Model 11 deep faced driver. The face of the driver had obviously been filed down and was almost straight and had no grooves, which made the club unplayable. To give you a little history and technical knowledge, in the 1950's and 60's there were three main golf club manufactures; Wilson, Spalding, and MacGregor. Premium wood clubs were made out of persimmon. Persimmon was a hard wood and heavier then maple or oak and made an ideal material for durability and transfer of power. MacGregor had the reputation of making the best driver heads. Their club designs were combined creations from some of their best players like Ben Hogan, Jimmy Demaret, and Tony Penna. Their craftsmen were also said to be the best in the business. After each head was cut, it was the craftsman's job to sand the edges and then sand and file the face to create the right amount of bulge and roll. It was a true art to create an aesthetically pleasing and high performing driver. Driver hitting surfaces are not flat. Each driver head had two curves called bulge and roll. Bulge is the curvature from the heel of the club to the toe and roll is the curve from the top of the club to the bottom. You would think that since the toe of the club was more "open" then the center of the club that a toe shot would have more right spin and go even further to the right. However the bulge gives a "gear effect" to be ball and actually rotates the ball in a counter-clock wise rotation that will lessen the errant hit and can result in the ball drawing. 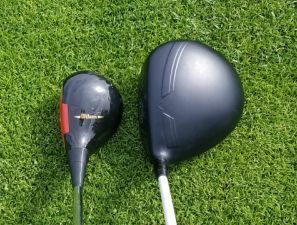 Modern drivers, because of the material and less twisting on off-center hits, have a little less bulge then the old wood drivers but still are an important element for playability. The roll on an old wood club created more loft towards the top of the club and less loft at the bottom. Hence you partly regulated your launch angle on where you hit the ball on the clubface. Modern drivers have very little roll on the clubface. So I showed Dow this ugly driver and asked why he was keeping it. Dow and Arnold were the best of friends from the time both started on the Tour. Dow even has a winter home at Bay Hill. Dow said that he and Arnold were at the Broadmoor one night at the bar and having a good time and they decided to go down to the golf shop and work on Arnold's driver. Arnold was a master craftsman and tinkered a lot with his clubs, so I wasn't totally unusual for him to fiddle with a club. Except at 12:00 midnight, his judgment might have been less than perfect. Dow said that they both worked on that club for a long time and thought they had created a masterpiece. The next morning both were anxious to see their creation. However what was supposed to be a Rembrandt turned out to be a disaster. They had totally ruined the driver, which Dow said was a favorite of Arnold's. I didn't ask Dow why he kept that driver, because it was worthless. Maybe he just kept it as a remembrance of their failed midnight attempt to create perfection. In any case it's a nice story about two best of friends being human. Pictured above is my 1969 Wilson Staff Model 21 driver (smaller than the Model 11), but notice how much smaller it is compared to my present Callaway XR driver. Almost unbelievable.